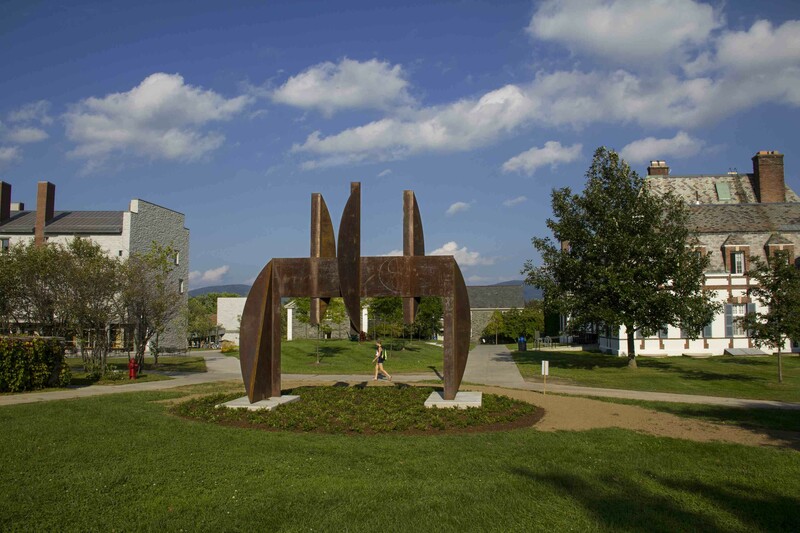 Middlebury College's sprawling campus has no shortage of intersecting pathways or massive, publicly displayed metal sculptures, but "Youbie Obie" — a 15.5-by-15.5-foot construction installed in late August — may take the cake. Located on the northeast corner of campus in a highly trafficked area near several dormitories, Bicentennial Hall, Wright Memorial Theatre and a college dining hall, the towering Corten steel structure was made by noteworthy contemporary sculptor J. Pindyck Miller, a 1960 Midd grad. The location was chosen to provide multiple visual perspectives on the sculpture, which appears deceptively flat when seen from the front, according to Middlebury College Museum of Art chief curator Emmie Donadio. Miller favored a "constructivist" style throughout his career, using geometric shapes to create abstract works with a clean, precise aesthetic. The artist considered "Youbie Obie" — the original version of which he completed in 1975 — one of his most significant works, according to the college. The artist created several iterations of the piece over his lifetime; the one installed at Middlebury was commissioned by collectors in Greenwich, Conn., in 1984. They donated the sculpture to the college and paid for the restoration of its metal surface, transportation and installation.